I found Susan on Instagram and was instantly mesmerised by her feed - full of beautiful butterflies and moths that she raises like her own (she calls herself a "moth mamma"). See if you can spot some of her creature friends in our photo shoot. 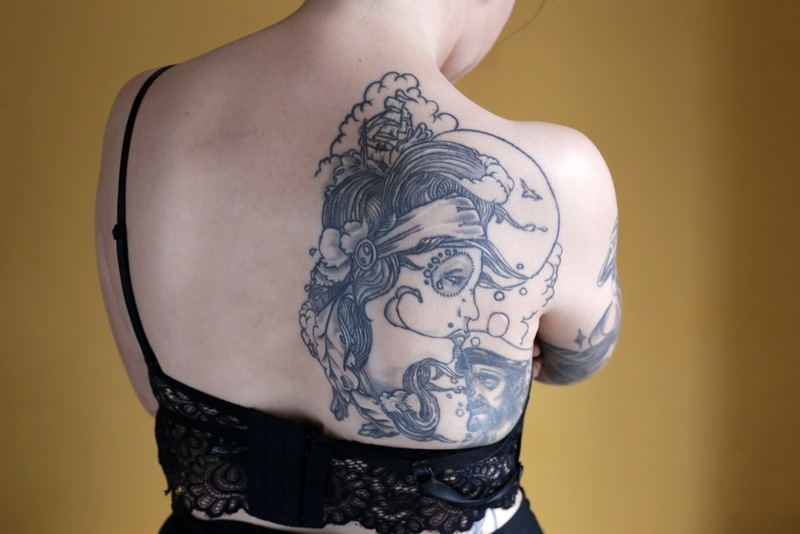 When did your love affair with tattoos begin? I think it was a slow burner. By the time I went to university, I just plunged into it, possibly due to my new found independence. I used to spend hours looking on Tumblr, in magazines and websites, at these beautiful incredible women of all shapes and sizes covered in artwork and I just believed they were the most stunning creatures in this world. I definitely think these women-crushes had a strong influence on my identity. To try and be someone I found attractive and inspirational myself, maybe? I started to focus on themes I was passionate about. I had a serious obsession with sea life and mythology and I think from there I just picked artists I liked and threw some ideas at them. Now I have all sorts of things tattooed on me! How would you describe your tattoos in three words? What part of your personality is reflected in your tattoos? I think there are a few tattoos that convey how I feel about myself and about the world. The quotes I have are very important. My outlook on life has always been quite pessimistic, but these tattoos are, I guess, ways to show me it isn’t always that way and a lot of my emotions are in my head. I guess they are a life lesson written on my body that I need to take note of. I have a hidden tattoo on my scalp of the chemical symbol of serotonin (the “happy” hormone); in some respect as a little way to poke fun at myself for always being so miserable! I am very women-positive and very attracted to the idea of eccentric and non-conventional beauty. 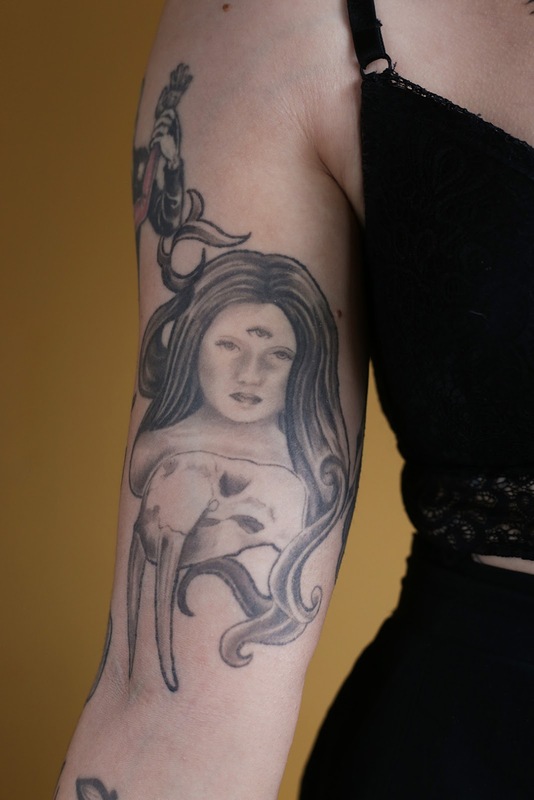 I try to get tattoos of women or female creatures that have something strange about them. 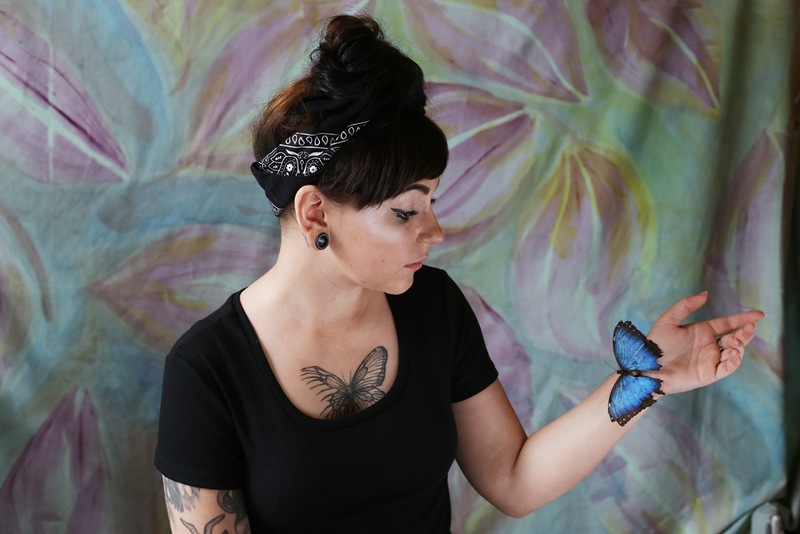 These ladies in the tattoos aren’t necessarily visually appealing, but are still able to captivate. Despite them all being different, I think they all give off a sense of being lost, and I would have felt that loss at the moment each one was inked on my skin. In saying this I feel quite sad, but it is very true, I do feel lost quite a lot in life! Do you have any tattoos that are connected to another person? I'm interested in how tattoos that are shared with or dedicated to loved ones evolve as our relationship with them changes. I have three tattoos that are linked to another person in some way. One is the Smashing Pumpkins logo. Myself and my best friend have it just behind our ear. A mutual shared love of our favourite band; nice and simple! The little bat on my wrist is a homage to my dad. Since I was young, he has always called me ‘bat’ (I have absolutely no idea how that started!) and it just seemed the right thing to do. I placed it somewhere that I could always see and be reminded of him. He still calls me ‘bat’ now and I’m 27! My other tattoo is a very simply done pair of cherries with ‘S & H’ inside them. This was my first tattoo and it’s 10 years old now. Myself and my best friend at the time both decided to get the same tattoo as a symbol of our friendship. We thought we would be best friends forever, but lo and behold, we fell out and the tattoo became a reminder of the pain I felt when we stopped speaking. I now think getting the tattoo initially was quite naive, but perhaps I would feel different if we had stayed friends throughout the duration. I did think about getting it covered, but something held me back. It didn’t feel like the right thing to do. I held onto some hope we would become friends again as long as I had the tattoo. We eventually contacted each other again after a few years and I was relieved to know he’d felt the same way and had kept his tattoo for the same reasons. We still speak occasionally now, but the closeness has gone. He is a great person and a great friend, we are both just different people now, I think. The sea-waif tattoo on my upper back was drawn by a very close friend around eight years ago. For my birthday this year he gave me the original doodle in a frame. I thought that was incredibly sweet. Can you tell me a little bit about the butterfly tattoo on your chest? What does it symbolise and why did you choose to depict the butterfly this way? I do think it was rather like fate that I stumbled on this tattoo design. It was beautifully drawn by Meg Langdale and posted up on her Instagram and as soon as I saw it I just felt like it had been drawn for me. Apart from the obvious ties to my wonderful hobby and my business, the half-tattered butterfly to me just conveys how raw and real life is. This is what a butterfly looks like that’s had a beautiful life. Their wings tear, they become aged and scruffy, but it means they’ve flown and danced and explored. They aren’t always perfect like you see in paintings and drawings. I needed to have it placed on my body somewhere that really conveyed how important it was - above my heart just seemed right! 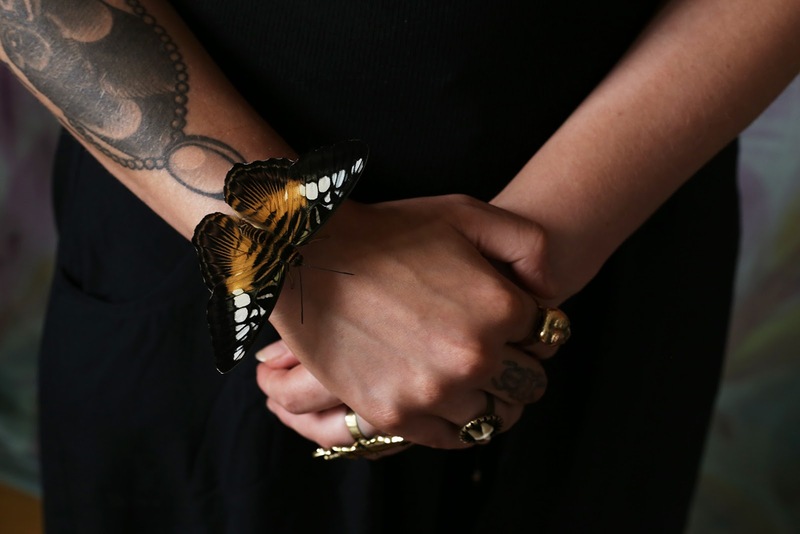 I’m hoping to develop the design across to my left arm into a sleeve of all the butterflies and moths I’ve raised. What would you tell your children if they were thinking of getting a tattoo? Do you think it's something a parent should have a say in? This is a tricky one! I would want my child to feel like they had independence and the chance to express themselves freely, in any part of life, not just around tattoos. However, I wouldn’t want them to just go and get something impulsive or rubbish! I think it can be a bit of a minefield in terms of what parents have control over. I guess once my child is 18 my parental clasp would be a bit looser and I’d just have to trust them to make the right choices. What process do you usually go through before getting a tattoo? For example, how long does it take you to decide on a design? Do you wait on an idea for a certain time or are you more impulsive? It varies really. With a few I’ve had the idea written down or I’ve drawn up myself and then waited for a long while, just to make sure I still wanted it. Then I would get them done by someone I trusted. 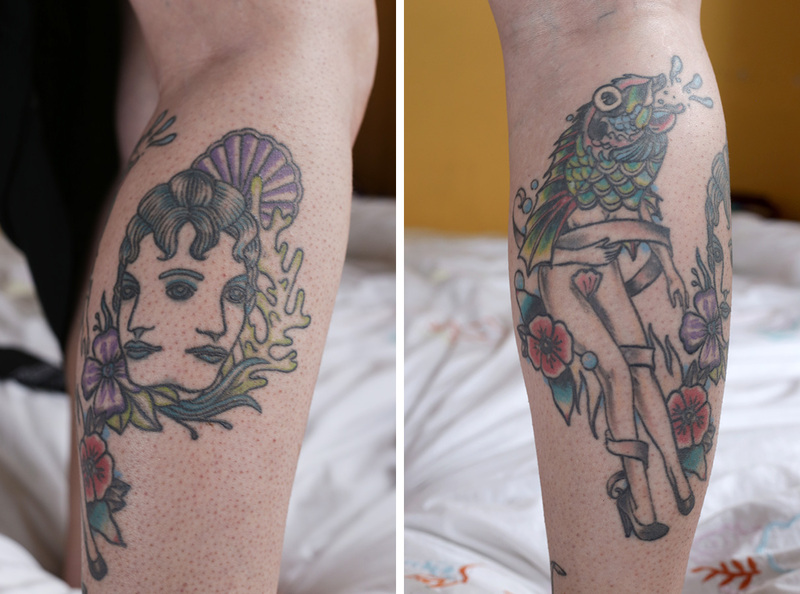 Some tattoos I’ve spotted in the artist’s sketchbooks upon arriving and decided I wanted them. It all depends on the subject matter, who’s tattooing me and how I’m feeling. Sometimes when I’m feeling impulsive, a tattoo probably isn’t the best thing to go and spontaneously get, but I haven’t had a bad one yet, thank goodness! I do think each tattoo I have is just as important as the other despite some not taking a whole lot of commitment from me at the start.